Near the end of college Alex was hired at Black’s Photography and worked there for nearly 8 years selling millions of dollars of camera equipment, photo finishing and frames. Leaving Black’s Alex began work at a photo studio in Hamilton where he learned many valuable lessons. How to handle photo studio customers and even some other lessons of what not to do as a photographer. After many years working in the public Alex was pushed into another journey and was forced from working for someone else to being self employed and opening his own photo studio. Through his career in photography he has taken over one million photos and handled over three million images in some form or another. Alex has handled events such as weddings, to hockey games to live jousting, Amature and Professional Wrestling, hundreds of concerts, a blacksmith convention, dog frisbee tournaments and hundreds of portrait sessions. Some of his work has been used by large companies such as The City of Hamilton, The Montreal Canadiens, The Hamilton Bulldogs, HEFCI, Much Music, Mohawk College, Liaison College, Breakaway Tours and many local clubs in Hamilton. 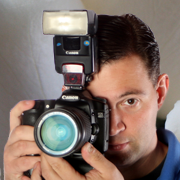 Alex uses Canon photography equipment and shoots using a digital SLR where possible. Alex always carries a swiss army knife from his lessons learned in Boy Scouts. Be Prepared. Gatorade. Is it in you? Well, it certainly is in Alex. Many of his endeavours leave Alex needing to be rehydrated. From photographing sword battles in the blazing sun to sporting events to a long day at an outdoor wedding Alex learned how effective this product is at keeping people functional. Alex’s most favorite shoot: Hockey Games have to be one of the things Alex likes to shoot the most. This combines two of his favorite passions… hockey and photography. Although the first time he shot The Toronto Maple Leafs back in high school would have to be one that certainly stands out. What made it so memorable was how hard it was to concentrate on my job as a photographer while being so close to sports idols while I was 18 years old. Alex’s most dangerous shoot: Sometimes I might think that it is a rough night doing club photography or even possibly girls water polo… but really, it has to be the first time I did Monster Trucks while on the floor of the arena or inside Blink 182’s mosh pit… tough call there. Alex’s most memorable photo: The photo he took holding his son in the mirror seconds after he was born, wearing surgical scrubs and fatigued to near exhaustion. This photo was later used to remind McMaster Hospital that Ross was born before midnight and to correct their records of his true birthdate because the photo clearly showed the clock in the delivery room… of 1140pm…. not after midnight when the form was filled out. Alex’s worst moment with a camera in my hand: Shooting Roger Clemens at The Skydome in the bull pen then a fire broke out…. while I was shooting with out a roll of film in my camera. I didn’t get him warming up and I lost the fire photos too because the camera was empty… that or having fireworks thrown as me by members of a wedding party I was photographing at Carmen’s one night. They thought it was funny to see how high I jumped while trying to scare me into destroying my gear. Alex’s hardest photo shoot to date: Memorial photos at his friends funeral. Shooting through tears and with trembling hands was one of the hardest tasks I have done as a photographer. Alex’s most flattering use of one of his photos: A photo from the memorial mentioned above was turned into a tattoo. Alex belongs to a medieval reinactment group know as the SCA. No, photography isn’t very period authentic. However, Alex has been allowed to take photos of hundreds of people having fun, teaching, learning, growing and sharing. In the beginning days of his photography there people wondered what he was up to and why he was doing it. Now, they drag him to where their kid is playing or when their friend is having a very special moment. Alex now gets to be part of all those special times and put smiles on thousands of peoples faces. Alex’s inspiration as a photographer: There are two. My high school photography teacher, Mrs. Arnold. She helped push me in the right direction while explaining what needed to be done with my raw talent to start making really good images. My second is Peter Parker. Yes, the same one others might know as Spiderman. His journalistic photos are always from unbelievable angles and his boss always is dumbfounded how he got them. Also, the quote that drives him “with great power comes great responsibility”. It has been said that a photo is worth a thousand words and to me, that is powerful medium to say something with. Originally, I intended on becoming a high school science teacher. Later endeavours pushed me further down the photography path.